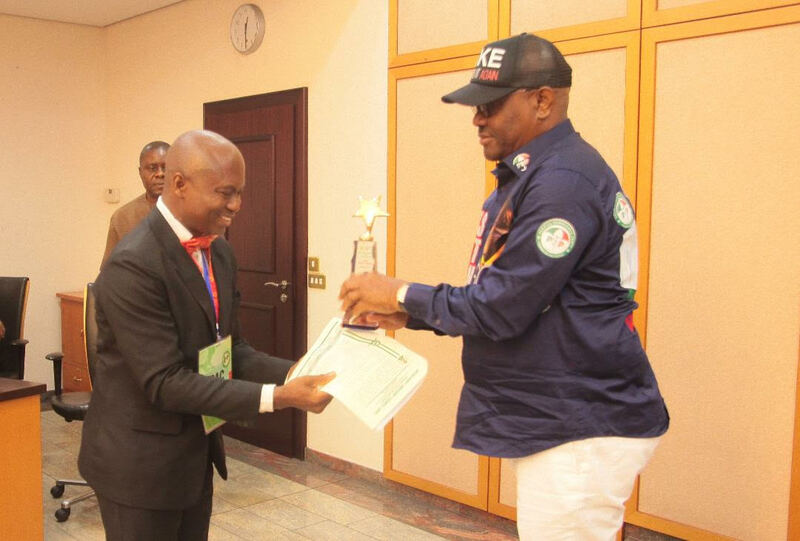 Satisfied by his splendid performance in the course of his first term, 89 Political Parties registered by the Independent National Electoral Commission (INEC), have endorsed Rivers State Governor, Nyesom Ezenwo Wike for a second term. Chairmen of the 89 Political Parties under the Inter-Party Advisory Council (IPAC) announced the endorsement of Governor Wike during a Solidarity Visit to the Government House Port Harcourt on Monday. Speaking during the visit, Chairman of Rivers State IPAC, Sir Precious Baridoo announced that IPAC has recognised Governor Wike as "the Face of Politics in Nigerian Democracy ". "We have decided to adopt Governor Wike as our sole candidate for his outstanding projects delivery which has earned him several awards. "Eighty percent of our active members of IPAC in the state are ready to work with you. You have done well. You are a leader in whom we are well pleased. Our involvement in the forthcoming gubernatorial election on March 2, 2019 will not only be total, but all inclusive to ensure your victory ". He stated that IPAC Rivers State will resist any gang up by INEC to manipulate the elections or postpone the polls. IPAC Rivers State declared that they will campaign for Governor Wike and also defend their votes during the elections. The 89 Political Parties noted that the achievements of the Rivers State Governor are worthy to be replicated during his second term because Rivers State deserves the best. Responding, Rivers State Governor, Nyesom Ezenwo Wike thanked the 89 Political Parties for their endorsement. He declared that he will always place the interest of Rivers State above other considerations. He said: "I appreciate this resounding endorsement and solidarity. What is important is the interest of Rivers State. It is important that we have agreed to work together for the good of the state. It is not easy for this number to agree to endorse our good work". Governor Wike called on all political parties in Rivers State to remain vigilant as Former President Olusegun Obasanjo has confirmed the plot to rig elections. He said: "We must be vigilant and at alert. You heard what Former President Olusegun Obasanjo said. APC cannot deny that Obasanjo was one of the pillars that brought them into office. Obasanjo cannot see evil at his age and keep quiet ". The governor said that the present INEC is not in any position to conduct credible polls because they take directives from the APC Federal Government. He said: 'But working together, we will never allow them to rig the forthcoming elections What happened in Port Harcourt on August 18, 2019 will never happen again ". He said that the people will resist any attempt to use security agencies to manipulate the polls. "If they think they will use security agencies to rig, that will not work. We are preaching violence free elections, but we cannot fold our hands for someone to bring violence to us. "If an armed robber comes to your house, you are under obligation to defend yourselves. The only way we can have credible polls is for security agencies and INEC to detach themselves from the APC", he said. He warned that Rivers people will not allow security personnel steal their mandate. He said that Rivers people will no longer play second fiddle.